I get asked a lot who the best speaker I’ve ever worked with is. There are so many ways to answer that. Who works best in a small room doesn’t always light up an auditorium. A funny, wise and informative conference presenter can fall spectacularly as an after dinner performer – and I’ve seen Wayne Hemingway do both. So obviously, it depends. 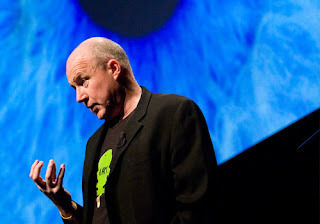 But for emotion, danger, connection, wisdom, inspiration and, yes, entertainment the answer is Kevin Roberts, author of Lovemarks, chairman of Saatchi & Saatchi, head coach at Publicis and, like me, he left Lancaster Royal Grammar School in a state of disgrace. I saw him again this week for the first time in ‘too long’. He was doing the keynote address at the Annual Hotel Conference in Manchester, curated by my old chum Chris Eddlestone, the self-styled Earl of East Lancashire. What struck me more than anything was his edge, an urgency to understand, keep up, interpret and act. But also to seek and maintain a higher purpose to whatever it is you do. He started by talking about millenials, the globally mobile digital natives – in particular how the hotels industry needs to think very carefully about what they want and need in the age of Airbnb. But, the algorithm can read the lines but only we can read between them and deliver emotional connections. His talks are always full of visuals, names, quotes and bursts of inspiration. This is the Age of the Idea, he said, and the biggest one of them all right now is disruption. Kevin took a lifelong love of rugby from his time at our school (I didn’t). And I remember an evening at the Town Hall in 2004 where he invited his mate Sean Fitzgerald to teach the first XV the Haka as part of a bawdy night of fundraising for a planned tour of Argentina. Raising money for privileged children, I think I called it. The mysticism of the All Blacks – the Haka is a part of that – does rather irritate me, just as Barcelona’s ‘more than a club’ creates the aura of semi-religious purity it so frequently fails to live up to. But if you’re going to do something well, then why not do it in such fine and grand style. I liked Kevin’s comment about the England Rugby team’s purpose and ideal was to win the World Cup on home soil. The All Blacks is to be the best rugby team that ever played the game. Wow. That’s really powerful. So he’s dead right when he says that no opposition is ever more intimidating than the legacy. There’s also a dressing room “all for one” culture of humility that doesn’t tolerate dickheads. Kevin said that a Kevin Pietersen would never have been an All Black. So why the war dance then chaps? A dose of Kevin is always a good part of any day, week, year. Truly, the best there is. It got me thinking about the old school. I wasn’t happy at school and have been an avowed opponent of the selective system all my life, up to, during and after, my own experience of its harmful effects not just on me, but on my friends and family who “failed” their 11 plus, scarring them for life. The bright lads from tough backgrounds who got through, but who seemed to drop out and drift away from the culture of cold showers, Latin, housemasters, Big School, prefects and rugby. As I said on BBC Radio Manchester this morning, I’m disappointed that selective state grammar schools are making a comeback. I am all in favour of improving schools and improving the life chances of our brightest and best. But the flip side of this elitism in state education is too cruel and a massive distraction from the important project of raising standards across the board. The problem with so much of our debate on all aspects of education is that it's fuelled by anecdote, gut feel and, frankly, picking the evidence to suit your prejudice. I have not seen any evidence whatsoever that grammar schools contribute to social mobility, higher earnings or leave anything positive in a community for the 90 per cent who don't pass the entrance exam. So, for what it's worth, the fact that Kevin Roberts and I went to the same school and have taken the paths we have taken in life has absolutely nothing at all to say to the debate about the future of education in this country.